I like to roast an extra head of garlic to serve with crusty bread to go with this soup. Just spread the roasted garlic on the bread like butter. As an added bonus, your house will smell delicious while the garlic is roasting! Cut squash down the center and remove seeds. Drizzle squash with olive oil and sprinkle with salt and pepper. Roast skin side up at 400° for 30 minutes, or until squash is soft. When the squash is cool, the skin will just pull off. Cut the top off a head of garlic. Add olive oil and salt and pepper and wrap in foil. Roast garlic in the oven with the squash. Saute onion and apple in olive oil until tender, about 5 minutes. Add chicken stock and bring it to a boil. Add squash and roasted garlic cloves to the pot (just squeeze the garlic to remove the roasted cloves) and simmer for 10 minutes, or longer if you have time. Next puree the soup with an immersion blender (or you can use a food processor) until smooth. Last, add heavy cream, nutmeg, and salt and pepper to taste. Add more heavy cream to reach desired consistency. To serve, ladle soup into bowls and top with chopped apples, shredded cheddar cheese. 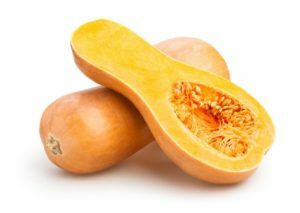 Here’s what to look for in the grocery store: Butternut Squash. Copyright © 2017 Our Everyday Dinners - This is an easy recipe for how to make Roasted Garlic and Butternut Squash Soup.